Day 252 / Hat 252: Black, baseball-style cap with red, white and blue embroidered Domino's Pizza logo on front. 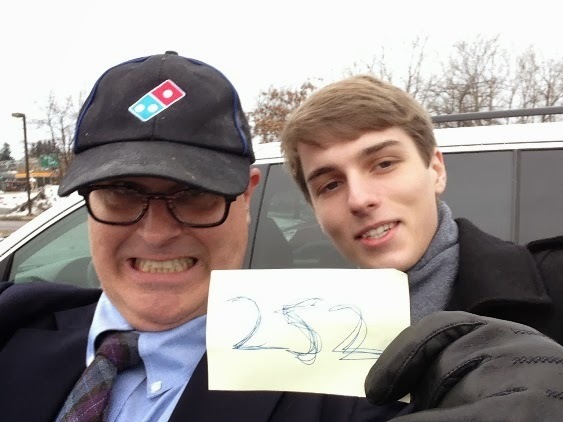 Graciously loaned to the Project by my nephew Preston McClary ( in the photo with me) who, at the time of the snap was headed to his job at the aforementioned pizza chain. So a sincere hat-tip to Preston (his second - see link to PC 53 below) for the loan - and a happy Groundhog Day to all. If I had to live one day over and over again (a la Bill Murray in "Groundhog Day") until I got it absolutely right, I could hardly have picked one more entertaining.